A native Greek speaker, Ioannis Ikonomou started learning foreign languages from the tender age of six years old. 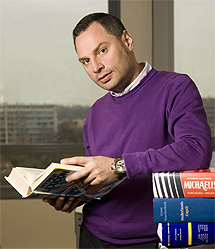 Born on the island of Crete, he now works for the European Commission in Brussels as a translator. He can speak a mind-blowing 32 languages fluently, including Greek, English, Italian, Russian, Arabic, Chinese, German, Polish, and Amharic. As well as spoken languages he can also understand and communicate in several ancient languages, such as Sanskrit, Latin, Gothic, and Pali. There are various character systems and alphabets used amongst the different languages that he can use fluently, although he says that no language is particularly easy or difficult – it is, rather, a case of passion and he advises that anyone can learn languages if they fall in love with them. Ioannis Ikonomou is celebrated for his phenomenal language skills and for the important role he holds at the heart of Europe. Born in the UK to a British father and a Polish mother, Michael George Francis Ventris was educated in Switzerland, quickly learning both French and German in addition to English and Polish. He had an aptitude for learning languages, eventually learning several others, including Russian and Swedish. After having served in the RAF during the Second World War, during which time some people believed he was involved in code breaking exercises, he became an architect. His translation prowess is noted for his part in deciphering an ancient code, known as Linear 2, discovered on items found on the island of Crete. His work and discoveries enabled historians to learn more about Mycenean Greece and the Cretan civilization. If it were not for the hard work of Michael George Francis Ventris and his peers, the previously mysterious language may have remained a secret for all time. Born in France in 1790, Jean-François Champollion was able to understand at least a dozen languages by the time he had reached the age of 16. He continued his linguistic studies, learning a combination of spoken languages and ancient languages. He had a particularly strong interest in Oriental languages, and was given the task of trying to interpret the writing on the Rosetta Stone. After his success with the Rosetta Stone, Jean-François Champollion continued to decipher the meaning of ancient Egyptian hieroglyphics. He gifted the world with the meaning of the ancient characters, as well as the key to the Egyptian system of grammar. His tremendous work gave much to historians, scholars, and Egyptologists all over the world. A Chinese monk, Xuanzang lived in the seventh century and was one of the most famous translators of his day. He remains amongst the world’s most renowned translators today, especially within Asia, due to his tireless work at translating sacred Buddhist scriptures. His quest led him on an adventure that lasted for a decade, during which time he learnt Sanskrit, and a subsequent number of years devoted to translating texts in Chinese. 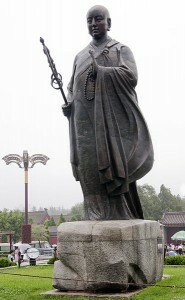 He played a huge role in shaping Chinese Buddhism and helping people to understand the teachings of the Lord Buddha. He is also credited for recording the political and social situations of the time. Translation Central is an ISO9001:2000 accredited organisation.